Emma Louise McGettrick attended the Six Month Practical Cookery Diploma in September 2012. Since then she worked in an Edinburgh restaurant as their baker and then moved to a position with Edinburgh Chef Mark Greenaway. 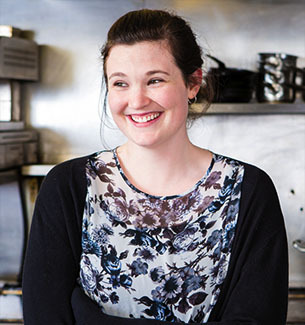 Emma Louise recently moved to London and is now working for chef Robin Gill. Here Emma Louise tells her story. I was lucky enough to grow up with a mum who is a great cook. Every Friday she baked cakes and buns– flapjacks were a firm favourite. Every evening there was a fresh meal. She watched cookery shows and has shelves of cookbooks. So, I suppose my passion started from watching her and her making me aware of fresh, good quality food from a young age. After university, I felt a little lost. I moved between jobs but got little fulfilment from them. My interest in cooking and food had grown and I thought if I could just make this passion a career then the daily grind would be so much easier. As I had studied English previously, a career in food writing particularly interested me but I knew that these types of roles were difficult to obtain. I went to speak to a knowledgeable and experienced food writer whose one piece of advice was to get training and to get into professional kitchens. He advised that to write well about cooking then you really need to have first-hand professional experience. As I was changing career, I decided that professional training would be the most direct route into kitchens. Having moved from Dublin to Edinburgh after university, the city had become my second home. However, when I decided to gain professional training I researched schools in Scotland and England. 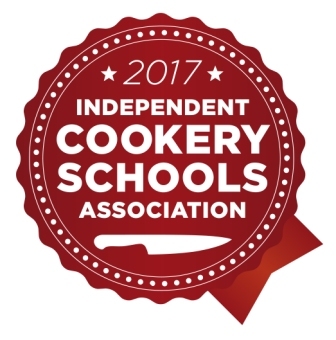 I felt I had lucked out when I visited Edinburgh New Town Cookery School not only would it keep me in Edinburgh city centre but its professional approach under the guidance of the very experienced Fiona Burrell and its beautiful and well-equipped premises made it hard for me to consider elsewhere. I went to ENTCS thinking I knew lots about food but I soon learned otherwise! The thing that most inspired me at the start was going back to basics; learning everything there was to know about eggs, for instance, and how to use them and then moving on to other ingredients in the same way. It meant that when we progressed to more complicated recipes, the base knowledge was already there. The selection of topics covered also inspired me as we progressed from sushi to food photography. By the time my course had come to an end, I felt I had a strong base knowledge across the board. The first would have to be planning, writing a time plan every day was never my favourite task but really it got me thinking through the recipes and carefully considering the most logical approach. There hasn’t been a day since leaving ENTCS that time planning has not been useful whether in a kitchen or office environment. This also links to organisation, learning how to work in an organised manner in a kitchen environment with others in close quarters was essential once I got into professional kitchens. The rounded knowledge of food and especially recipes and recipe layouts has become especially useful in recent jobs. After leaving ENTCS, I spent a few weeks doing stages (work placements) in some of the top restaurants in Edinburgh to gain as much hands-on experience as possible. I then got a full-time job creating the cakes, desserts and baked goods for a lovely restaurant/café/deli. Here, I managed my own section, developed recipes and got a real taste of kitchen life. I spent a couple of years in that role and in my spare time I continued to complete stages, I worked in spells for a wonderful catering company called Appetite Direct and I also did a little bit of teaching at ENTCS. Having gained much-needed kitchen experience, I was always trying to think of ways to make the leap into food writing. I wrote a little for some local food magazines and but wanted to make it a full-time role. During my time at ENTCS, I completed a stage at Restaurant Mark Greenaway. I went back to speak to Mark and discovered that he was looking for someone to assist with in-house PR & marketing. He also mentioned that his first cookbook was in the pipeline so I jumped at the chance. I worked closely with Mark on his book, Perceptions – Recipes from Restaurant Mark Greenaway. Helping him to put pen to paper, coordinating with his publisher and assisting with photo shoots. I never understood the scale of the task until we were into it but to this day it is still one of my proudest achievements. Perceptions went on to win the best world’s best chef cookery book at the Gourmand World Cookbook Awards 2017 which really was the icing on the cake. I made the move to London this year and the food scene down here is out of this world. I have been lucky enough to get work alongside a very talented chef, Robin Gill. His four restaurants are somewhat of a chef’s dream with the best local produce coming from the restaurant’s rooftop and their own farm. Robin is currently working on his first book, ‘The Larder Chef’, and once again I am helping him to get his recipes and stories in order and coordinating with the publisher to ensure deadlines are met. I would say that if you are looking for a career in food or hospitality in any shape or form then ENTCS is a great place to start. You will learn all that you need to know from some really knowledgeable people and it will give you the confidence you need to get started in the culinary world. Gain as much experience as possible! Make a list of the top places that you would like to work and call each one to arrange work placements. Even if it is just a week here and a week there. Once you build up relationships in these kitchens then you never know where it might lead!